The -nh option prevents the compared files from being added to ExamDiff Pro's history, which is handy because, since you're comparing temporary files, it wouldn't make sense to remember them. You can read more about this option here. The -dn1:name and -dn2:name options set the display names of the files being compared. They can be helpful if you don't want to see ugly temp file paths and your version control program sends file labels as parameters. 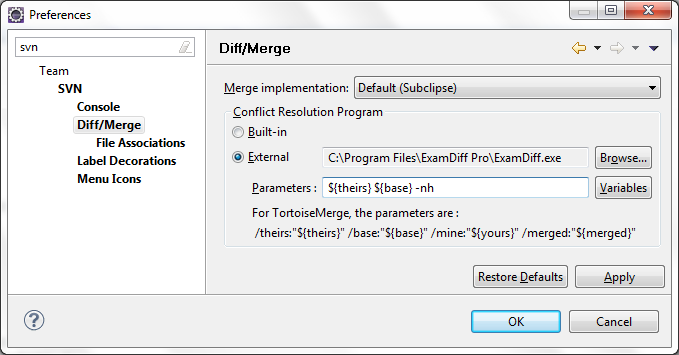 Check out the ExamDiff Pro version control integration page for specific instructions on integrating ExamDiff Pro with Git, Mercurial, Subclipse, TFS, Visual SourceSafe, and other version control solutions. You can also refer to our previous blog posts on integrating ExamDiff Pro with Visual SourceSafe and Team Foundation Server.